NSW Masters Track Championships 18 at DGV - Lise Benjamin (Sprint - Silver Medal) with Anna Whitton (Sprint - Gold Medal). Lise set a W7 World Best Time in the 200m qualifying at 13.038secs. NSW Masters Track 18 - Mike Lawson took Gold in both Pointscore & Individual Pursuit. 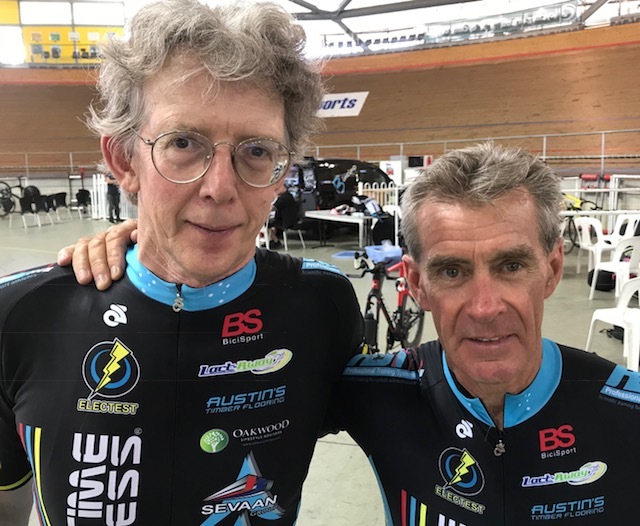 * NSW Masters Track Championships from 13-15 Feb @ DGV - BiciSport starters included Graham Cockerton, Mike Lawson, David Browne, Lise Benjamin & Peter Verhoeven. Mike Smith was a DNS due to illness and will be a no show in Melbourne for Masters Nationals. Day 1 - Sprints .. Lise Benjamin W7 Silver after setting a W7 World Best Time in 200m qualifying of 13.038secs. Day 2 - Individual Time Trial & Points - ITT Lise Benjamin W7 Gold @ 40.4secs , Mike Lawson M8 Silver @ 41.2secs, Graham Cockerton M5 7th @ 38.5secs Points Lise Benjamin W7 Gold, Mike Lawson M7 Gold, Graham Cockerton M5 @ 5th. Day 3 - Individual Pursuit - Mike Lawson M8 Gold, Peter Verhoeven M6 @ 7th Day 4 - Scratch Races ... Lise Benjamin W7 Gold & Graham Cockerton M5 Silver in a close finish. David Browne & Peter Verhoeven rode well. * Riverina Interclub @ 17 Feb - Frank Signor, Melissa & Peter Budd rode well in the first Riverina Interclub of the winter road season. * Junior Track Nationals/Masters Track Nationals - Robyn Sprouster (BiciSport Commissaire) is spending two weeks in Melbourne (Bleak City) at the upcoming Track Nationals. * Feb 21 (Wed) - Berowra Gruppetto @ 7.30am @ opposite Berowra Railway Station for 60k to Calga & return. 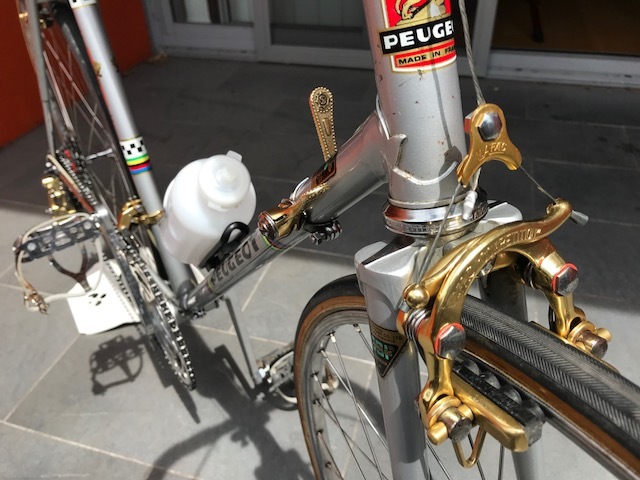 BiciSport supporter Herve Boutin recently returned home from France and after much coercing has brought back a special Peugeot PY-10. This is not any old regular PY 10 retro bike but a Peugeot Pro team bike from the 1975 Tour de France. Not only did Bernard Thevenet win Le Tour that year on a PY-10, all of the Tour team bikes during that Tour had gold anodised componentary. The story goes thus ... Max Boutin (Herve's father) wanted a bike to ride around his local French village on a Sunday morning. Max worked with Claude Riotte, who in turn was a brother of Raymond Riotte. 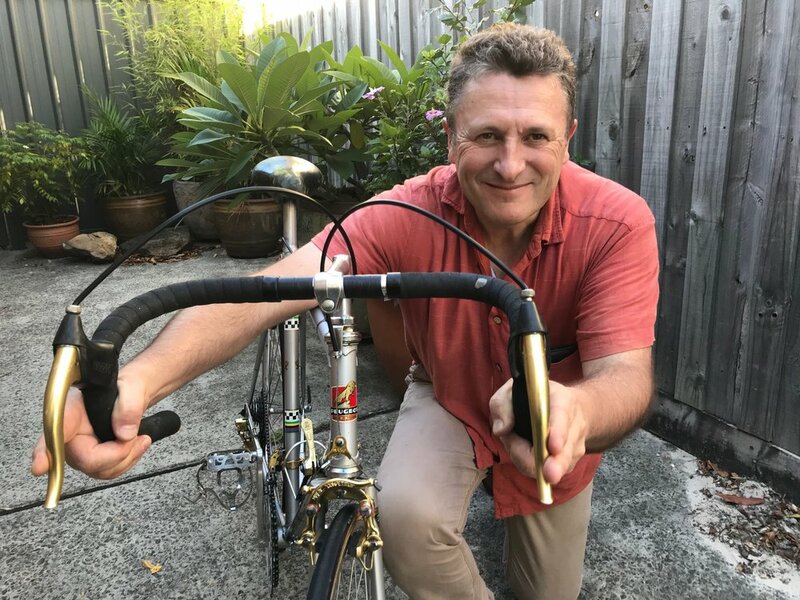 Raymond was a leading French professional in the famous Peugeot pro team ... next minute arrives a delightful Tour de France team bike on Max's doorstep. Tour de France 1975 - Bernard Thevenet aboard a silver Peugeot PY-10 with special gold anodised brake levers, brake calipers, gear levers and front & rear gears. Milan San Remo Classic 1976 - a French peloton of Peugeot PY-10's lined up before the start in Milan. Componentary on the San Remo PY-10 is the more traditional silver. The restored Herve Boutin Peugeot PY-10 with period correct white cotton handlebar tape. Golden gear levers and gold front & rear gears dress the bike nicely. Putting every other professional race that comes before now strictly into the 'showboat' category ... the Belgian professional road racing season commences 24 February with Het Volk (some lazy and ill informed latecomers call it Het Niewsblad) followed by 25 February with Kuurne Brussel Kuurne.